Print your logo onto these custom printed band-aid dispensers - pack of 10 or one of our other innovative custom printed bandaids and use them in your next marketing campaign as a unique giveaway item. These promotional giveaways are great for various Hospital, Emergency or Health and Wellbeing promotions. Promotional Band-Aids will blow a breath of fresh air into your marketing campaign, and will make an excellent, affordable mailout! Promotional Band-Aids are a fun and unique way to reach your audience. These promotional giveaways are great quality, and are great for building brand awareness and brand loyalty. 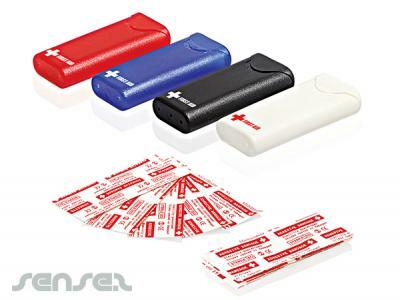 Custom printed promotional Band-Aid Dispensers with logo print, contains 10 small bandaids. Custom brand these band-aids or one of our best-selling promotional health & pharmaceutical items»custom printed bandaids with your company logo! Your promotional band-aid dispensers - pack of 10 can be silk screen printed in 1 or more colours. Costs shown include a 1 colour logo print on your custom branded band-aid dispensers - pack of 10. We can print more than 1 colour, however it incurs extra costs. We can achieve a perfect PMS colour match for the print. Personalise your band-aid dispensers - pack of 10 or custom design custom printed bandaids for your marketing campaign. How can these unique promotional band-aid dispensers - pack of 10 or our personalised custom printed bandaids fit in with your marketing strategy and help you maximise your brand exposure? Our custom made Band-Aid Dispensers - Pack Of 10 can be produced from a minimum quantity of 50 pieces. We can have your logo branded on these corporate Band-Aid Dispensers - Pack Of 10 in 1 Colour Silkscreen Print. A setup fee of AU$180.00 will apply to make the film.